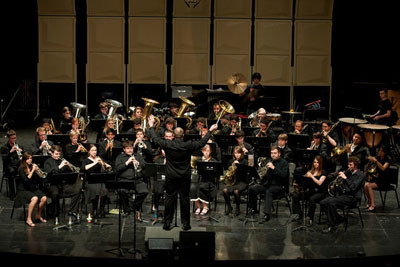 Led Mr. Bill Tiberio, the University of Rochester Brass Choir (MUR 170) is an ensemble dedicated to performing quality brass music at a high level while fostering a spirit of community among brass players on the River Campus. The group is open to experienced trumpet, horn, trombone, euphonium, and tuba players who played throughout high school, as well as faculty, staff, alumni and community players. Repertoire includes fanfares, Renaissance pieces, contemporary literature written specifically for brass, and arrangements of light classics and popular music. Members are invited and encouraged to arrange or compose for the group. Recent selections performed by the Brass Choir include Brian Balmages' Fanfare Canzonique, Eric Ewazen's Western Fanfare, and Edgar Winter's Frankenstein. Auditions for Brass Choir for fall 2018 will be held on August 28, 29, 30 and 31, and September 4 in O'Brien Hall. You must secure your audition time in advance by signing up online. Rehearsals take place on Friday afternoons from 2:30-4:30 p.m. in the Strong Auditorium. Contact director Bill Tiberio for more information. In 2010, the UR Brass Octet was formed to provide more flexibility for outreach performances at schools and churches, and to develop a more intimate chamber music-type experience for select participants. In its short existence, the Brass Octet has already been featured in concert at admissions open campus events, at Union Presbyterian Church in Scottsville, NY, and in their own recital at St. Luke and St. Simon Cyrene Church in downtown Rochester to benefit the church's "Right On" summer youth camp program. In January of 2011, the full Brass Choir embarked on its first-ever concert tour to Washington, D.C., performing at the Kennedy Center, National Presbyterian Church, and National Basilica for such notables as former Senator Elizabeth Dole and former NASA astronaut John Glenn.